Join us for the Carpe Diem-Washington Revels Family and Community Sing. This month we celebrate Thanksgiving with songs of grace and gratitude, and special musical guest Mr. Gabe leads us in some fun sing-alongs! DATE/TIME: Wednesday, November 21, 2018, 6:30-8:30 pm. 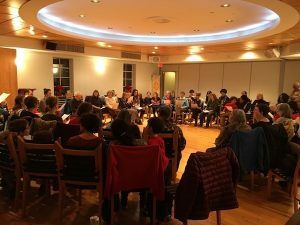 We gather on the 21st of every month — join us on December 21 for our next Sing and community caroling!